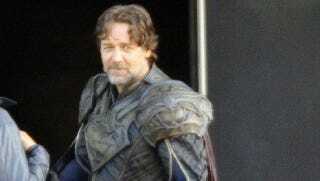 Check out the first ever look Superman's alien daddy, Jor-El — as played by the bearded Russell Crowe. Note the lovely alien frock, and Superman "S" emblazoned on his Kryptonion chest? In Zack Snyder's new Superman movie Man of Steel, Clark Kent will have two dads. Kevin Costner is his farmer Earthling adopted Dad Jonathan Kent, and Russell Crowe is Jor-El. This is the first real look we're getting at life on Krypton, or at least a bit of Krypton fashions, taken from the set. What do you think? Also, which alien dad would win in a fight: Marlon Brando Jor-El, or Crowe Jor-El? Check out another image of the new Jor-El over at Superman Of Steel. Thanks for the tip @MMiotts.